There are launches, and there are LAUNCHES. When I was a young boy growing up in Harrington Park, New Jersey in 1961, I built model rocket crafts equipped with Estes engines attached to payloads consisting of spiders and ants which gently drifted back to ground zero after short flights hundreds of feet into the lower troposphere. Eight years later, I would witness the flight in which a six million pound Saturn-V engine designed by Wehrner von Braun and his staff of 700 German rocket scientists who had re-settled in America after the second World War would launch men in a 90,000 pound capsule at an initial velocity of eight miles per second during mankind's first flight to the moon. That was a launching, which brings me to the launching of a new book, The Good Karma Diet by Victoria Moran. The Good Karma Diet (Eat Gently. Feel Amazing. Age in Slow Motion.) is the "Saturn-V" of books and will be launched at Barnes and Noble on 82nd and Broadway, in New York city May 20, 2015, at 7:00 P.M. Meet the author and have her autograph your personal copy of a book representing one small step for a woman and one giant leap for mankind! The Good Karma Diet is Moran's 12th book, and is sure to change the world as did America's first moon landing. I didn't know it was possible to feel this good…The first thing I noticed after making the switch to more fresh food was how positive I felt. This is more than just words on paper to fill pages. This is The "good karma" that I share with Moran and other vegans as a secret delightful and astonishing discovery. The first step necessary to converting a carnivore to vegan seems mystifying to non-vegans. In Chapter 2, Victoria relates that "Good karma eating is as simple as can be…" and then converts complexity to simplicity by making it happen. She then outlines the various denominations of vegans who enjoy a wide variety of plant-based options. By the time a reader gets to chapter 5, the karma is beginning to set in. Moran writes: "The how-to is simple: Eat food that is beautiful and delicious. " How long will your conversion to the good karma diet take? Moran explains all in chapter 6 by laying out her unique 21-day plan. By the time you get to chapter 12 on page 87, Victoria explains the reason why many new vegans excel in eating unhealthy. She wisely shares and inspires with all of the good karma she possesses: "Before you feed yourself, nourish yourself. " That concept alone could fill a book, but Moran adequately explains in this chapter why some vegans convert temporary misplaced urges into illogical reasons to leave a plant-based diet. That results in bad karma. It's great karma to stick with the alternative good karma. On page 213 of her substantial book before getting to the recipe section, Moran cites a brilliant quotation by anthropologist Margaret Mead, who observed a cosmic irony of karma: "It's easier to change a man's religion than to change his diet." In The Good Karma Diet, Moran is a missionary and successfully achieves the challenge of Margaret Mead by converting man's diet "one small step"…at a time into one giant leap of good karma. Victoria Moran has been a Main Street Vegan® for 31 years and is an obesity survivor, maintaining a 60+-pound weight loss for all this time. She’s the bestselling author of twelve books, including Creating a Charmed Life (in 30 languages around the world) and the plant-based weight loss classic, The Love-Powered Diet, and the iconic Main Street Vegan. 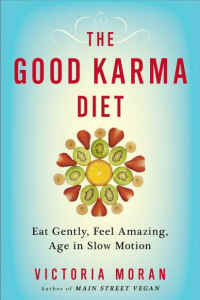 Her latest book is The Good Karma Diet: Eat Gently, Feel Amazing, Age in Slow Motion. Her college thesis became Compassion the Ultimate Ethic: An Exploration of Veganism, originally published in 1985 and the first work on vegan philosophy and practice to come from a major publisher. Victoria is also an inspirational speaker, corporate spokesperson, certified holistic health counselor (HHC, AADP), graduate of the T. Colin Campbell Foundation/eCornell program in plant-based nutrition, host of the Main Street Vegan radio show/podcast, and founder and director of Main Street Vegan Academy, training and certifying vegan lifestyle coaches.